With the beginning of a new year my husband and I are making new efforts to eat healthy and choose healthier options for our snacking. I have found that fitting protein into my diet helps to curb the sugar cravings and make me feel more full. Finding healthy, natural sugars can be tricky and at the end of the day it is nice to have a little treat! Enter Healthy Protein Popsicles! These tasty treats really fit the bill and are so delicious! 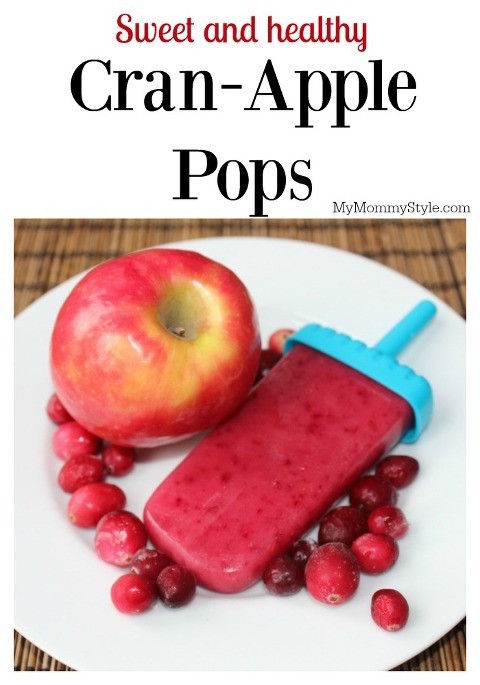 I love these healthy treats because they are loaded with vitamins and minerals by using applesauce containing natural cane sugar and because they are frozen you get to enjoy the goodness even longer! I had made popsicles in the past but had only used liquid. This time by adding new textures through greek yogurt and Mussleman’s applesauce it gave the popsicle a whole new texture that I love! It was really important to me to find an applesauce that was full of flavor and not pumped with high fructose corn syrup. An easy to way to make a popsicle/treat is by using this popsicle form I bought from amazon and because I have a teething baby I wanted to make him some frozen treats too to smooth his sore gums. You can buy forms to make your own teething popsicles here. Depending on the popsicle form you buy the amount you need will vary. For my popsicle forms they need about 1/4 C per popsicle. I found the best results by mixing or blending ingredients together before putting them into each individual popsicle form. You can spoon the mixture into each form or use a small measuring cup with a spout, whatever you have available. Combine applesauce & cranberries into a blender. Blend. Pour into popsicle forms and allow to freeze 6 hours or overnight. Enjoy! Have a teething baby at home? Use this same recipe to make little popsicles for baby! A fun addition to this recipe could be banana to make the texture a little smoother and an avocado for healthy fats for the baby. *I would leave the scoop of protein out if you are making these for a baby. Combine apple sauce and yogurt. Slice strawberries into heart forms and place them inside the popsicle forms before pouring in the mixture. I found it was easiest to pour half of the mixture into the form and then slide the sliced strawberry down along the side of the form before adding more mixture. Allow to freeze 6 hours or overnight. These popsicles are so good! They have the perfect blend of sweet and are only 47 calories total! I will be making these again and again knowing they are packed with protein, nutrients, and vitamins. Before long these little homemade treats have become a family favorite and my children are thinking about different flavors and mixes that they think would taste the best. I wanted to create these popsicles out of something that wasn’t filled with fructose corn syrup or artificial sweetners/dyes and I found the perfect solution: Mussleman’s Apple Sauce! 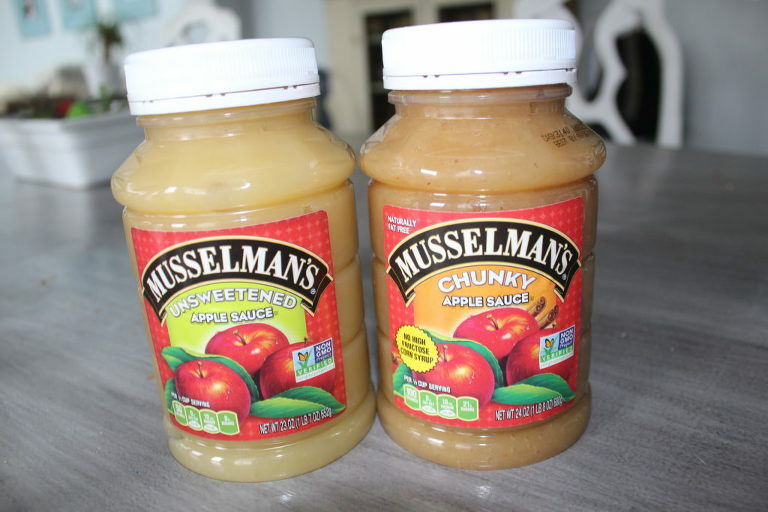 Musselman’s apple sauce is non-GMO, is sweetened with cane sugar, contains no high fructose corn syrup! It is available in family-size jars, single-serve cups, and convenient squeeze pouches. I also love that all of the apples are home grown in the USA! Mussleman’s comes in a variety of flavors and textures so you can mix up your snacking and find just the right fit for your needs. I haven’t tried a flavor I haven’t loved and using it as an easy side dish solution for my kid’s lunches is always a plus. You can buy small cup size for easy snacking solutions as well. You can also find other creative recipes on their website as well. You can follow along on with Musselman’s Apple Sauce Facebook page for more recipe inspiration and discounts! *While Musselman’s uses GMO-free cane sugar in all of their apple sauce, the Honey-Cinnamon flavor contains honey, which cannot be verified GMO-free. Which ways do you like to fit healthy protein into your diet? Linked up at Buns in My Oven, Katherine’s Corner, Tidy Mom, The Pin Junkie and Saving 4 Six.